As part of the Fulbright East Asia Pacific Regional Travel Program, 2015 Fulbright Scholar Dr Jung Ha-Brookshire visited Incheon, Korea to attend the 2015 Korean Society of Clothing and Textiles Annual conference held in the Incheon National University. She delivered a speech on “How to use qualitative research methods for historical research” to a group of Korean clothing and textiles historians. She also presented her latest research on the social impact of cotton trades in the late 19th century in Korea. Jung received the best research paper award in the poster presentation category. On October 19, 2015, she visited the department of Clothing and Textiles at the Seoul National University, where she shared her latest research publication on the Moral Responsibility Theory of Corporate Sustainability with faculty and graduate students. She now has several research proposals and ideas for further collaborations. Dr Jung Ha-Brookshire is an associate professor and director of graduate studies in the department of Textile and Apparel Management at the University of Missouri and is currently teaching at the Institute of Textiles and Clothing at Hong Kong Polytechnic University as a Fulbright PolyU Senior Scholar. The Fulbright East Asia & Pacific Regional Travel Program, funded by the East Asia Pacific Fulbright Office at ECA, offers local institutions, posts and commissions the opportunity to benefit from the academic and professional expertise of Fulbright Senior Scholars based in another country within the East Asia & Pacific region (Australia, Brunei, Burma, Cambodia, China, Fiji, Hong Kong, Indonesia, Japan, South Korea, Malaysia, Mongolia, New Zealand, Papua New Guinea, Philippines, Samoa, Singapore, Taiwan, Thailand and Vietnam). Visiting Fulbright Senior Scholars may wish to present lectures, present graduate or faculty seminars, undertake curriculum advising, public lectures and/or panel presentations. If you wish to learn more about the Regional Travel Program or apply for a grant please click here. 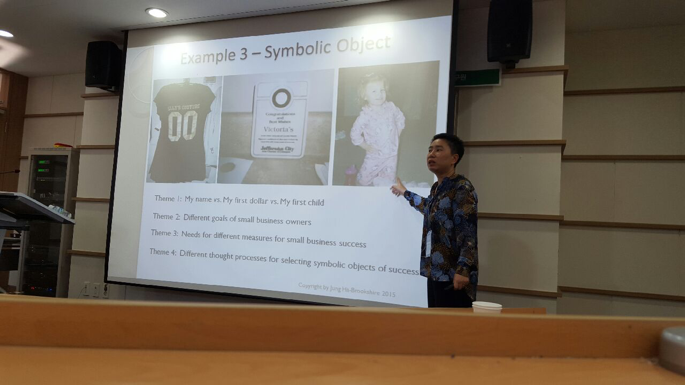 Dr Jung Ha-Brookshire delivers a speech at the 2015 Korean Society of Clothing and Textiles Annual Conference in Incheon National University-Songdo.